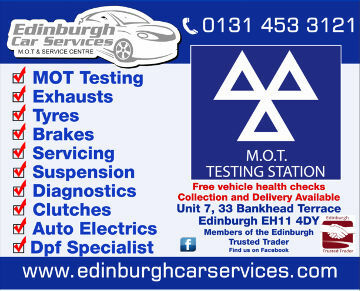 Save money: Instantly compare MOT costs in Edinburgh to find the best deal. Book a service at the same time as your MOT and receive further savings. Some of our garages offer MOTs for just 1p when booked alongside a service! Save time: Book your MOT test online – no upfront registration required! No need to ring around, hang on the phone or wait until the garages are open – find and book the best MOT deal quickly and easily with our online booking tool. Quick and easy: Simply enter your vehicle registration number and post code, compare prices, choose a local garage and book your MOT. No payment required: You won’t pay a penny until the work is complete. Speak to an expert mechanic: If you need to speak to a mechanic, call one of our experts today on 03304 004439. "Great friendly and most importantly HONEST service." "First time using Steins Garage but won't be the last. I came in for an MOT on a 20 year old car, fearing the worst but Craig did a great job on it for a very fair price. Happy to recommend this garage to anyone." "Great service, would highly recommend. Very honest and helpful." "Very happy with garage! Always informative about work that needs done. Seem to be very fair and reasonably priced!" "Excellent work from the team. They keep me informed of work required and cost. Friendly, informative and always have great advice for the upkeep of the vehicle. I never feel intimidated or unsure of what they tell me. I trust them, which is critical for me." "Friendly and approachable environment. Thorough explanation of all work carried out was provided too." "Friendly staff and helpful advice"
"These guys are amazing and very professional. Strongly suggested!" "Great service and very fair prices"
"From the initial booking to the payment - a professional, approachable team"
Find MOT Garages in Edinburgh; compare prices and book online, from the comfort of your own home, with BookMyGarage. Use our MOT booking tool to check when your MOT is due, compare cheap prices, read through customer reviews and make your booking. Don’t pay a penny until the work is done! So, is your car due an MOT test? The test will check whether your car meets the road safety and environmental standards, and you will be prosecuted if driving on the roads when your MOT has expired. The only exception to this rule is if you are driving it to a garage to be repaired or to a pre-booked MOT test. Make sure you avoid the risk of missing your test date by booking your MOT well in advance using our comparison tool; the MOT cost will vary for each garage so this is a great way to save money and ensure you are booking a cheap MOT. Use the MOT comparison tool to get instant prices in your local area. It’s the simplest way to learn more about the garages in your area and get high quality servicing and repairs. Our directory features thousands of MOT test centres across the country and you can search for them by postcode or by selecting an area from the list below. This will provide you with a list of garages and you can choose any of them to visit their profile page and find out everything you need to know before booking the MOT. Edinburgh deserves its reputation as one of the most striking and compelling cities in the world. It’s an ancient place steeped in history but is also a modern, dynamic capital. It hosts one of the most famous cultural festivals in the world, as well as cutting-edge art, captivating bars and great restaurants. It radiates an animated, chic ambience with a distinctly Scottish twist.